Mark Cavendish slipped 26 seconds behind leader and Dimension Data team-mate Edvald Boasson Hagen after the third stage of the Tour of Qatar. The 30-year-old Briton, who won the race in 2013, lost the race leadership despite finishing a strong seventh in Wednesday's 11km time trial. Norway's Boasson Hagen finished in 13 minutes 26.98 seconds to win the stage by 25 seconds and take the lead. 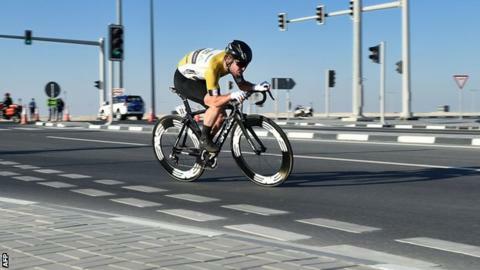 The five-stage race concludes at Doha Corniche on Friday. Team Dimension Data described Cavendish's ride as "another strong performance"
Cavendish plans to decide during the race whether he will compete at next month's track World Championships in London. He told BBC Sport in January he was not sure how a winter spent mixing road and track racing would affect him. "I could be flying, I could be catastrophic, I could be indifferent," he said. The Isle of Man rider has started the season well, going close in two stages of the Dubai Tour and winning Tuesday's opening stage in Qatar. A winner of 26 Tour de France stages, Cavendish faces a packed schedule in 2016 with August's Olympic Games in Rio also a target.